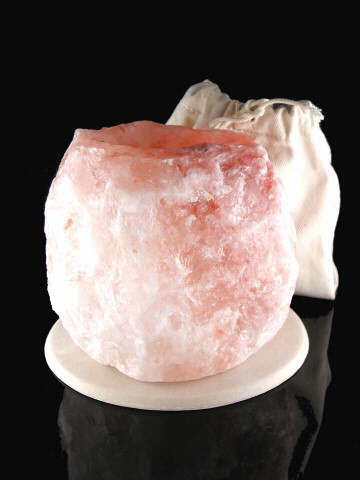 Himalayan Salt Crystal T-Lites are believed to emit negatively charged ions into the air, which help counteract the effects of electromagnetic pollution caused by electrical equipment, such as televisons, electric lights and computers. The ancient salt deposits found in the Himalayas have been protected from modern forms of pollution by a layer of molton rock and are, therefore, completely pure and natural in origin, and there are no preservatives or coatings on the t-lites. It is widely accepted that Himalayan salt is the cleanest salt available on the planet and that it contains 84 of the possible 92 trace minerals found to exist in our blood. This gift set comes complete with a t-lite, a hand made pottery coaster (D130mm) and an un-dyed, muslin gift bag. Also comes with a leaflet containing fascinating information about Himalayan salt. As each t-lite is hand carved, each differs slightly from the next in size, shape and colour but the average size is between H100 and 120mm.